Here are Some Quick Links and Answers to Frequently Asked Questions. Check back for updates or contact us with your question. Q: My Kodiak will not connect. A: Please review this document first to make sure both antennas are properly installed. Q: How do I adjust the Roaming Aggressiveness on the Kodiak’s Intel WIFI adapter. Q: Where can I find a wiring diagram? 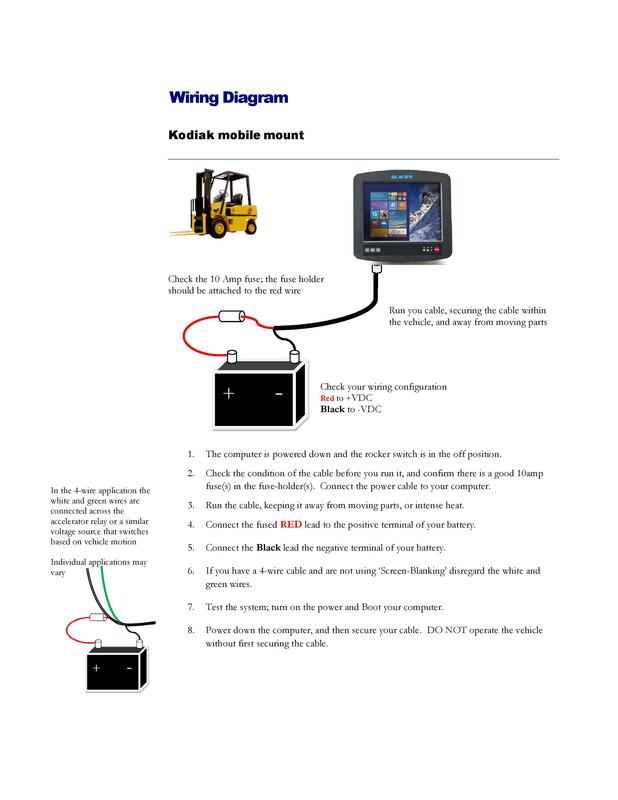 A: Please check the Kodiak Quick Reference Guide, Here. Q: Where do I find drivers? A: Please Check our Drivers Page. Q: How do I set the Kodiak for the correct operating system? A: Turn on the Kodiak power, during POST tap the DEL key to open the Aptio Setup Utility. Open the Advanced tab/Miscellaneous Configuration/OS Selection, select the appropriate operating system, and save settings and reboot. Q: Is there an option for running Linux on the Kodiak? Q: Is there a way to set up the Kodiak that my users have no access to anything other than the application we are asking them to use? A: The Kodiak is built as a standard X86 PC so you can use the operating system to manage/lock down the user interface. Q: Is there a feature that allows me to lock out a user from accessing the unit through the USB ports? Q: Is there power on the custom serial port to connect a serial scanner? Q: What are the available stylus options? A: You can request an RMA online, Here. Q: How should I package my computer? A: Please ship Glacier Product using the original carton and padded ears. Remember to remove all peripherals, mounting components, and external antennas. Q: How do I get packaging if none is available? A: You can Email Glacier to request packaging. Why should I choose an all-in-one like the KODIAK versus another tablet computer? Tablet computers are a very popular choice for mobile workers, in the facility and out in the field, but the Kodiak is specifically engineered and constructed for use on a lift truck. The Kodiak has a hardened enclosure, internal shock and vibration protection, internal power supply, UPS, and custom mounting solution. How do I get power from my forklift to the Kodiak? Glacier’s design allows you to power the system with a simple input cable between the lift and the Kodiak. This solution will work on propane and electric lifts, older electric lifts with worn brushes–prone to voltage spikes, or with the battery draw of a propane lift on a cold day. And The Kodiak’s internal 12-48 VDC power converter gives you the flexibility to move the unit from one type of lift to another without additional equipment or special wiring. Is the Kodiak an industry standard computing platform? Absolutely, the Kodiak houses an Intel processor and runs numerous operating systems including Windows 7 and Windows 10. The Kodiak has 4 GB of DRAM and a large solid-state drive for plenty of onboard storage. Communication with your network is via an integrated 802.11 WiFi chip. The I/O across the bottom of the unit is industry standard to accept a variety of peripherals. Loading your application onto the Kodiak is exactly the same as loading onto your desktop or laptop. Can I mount the KODIAK on my forklift? Yes, and whatever the situation there is a solution. We have mounting systems for sit–down and stand–up lifts, stock pickers, pallet jacks, and carts. You can mount your Kodiak to the roof–cage, pillar, dashboard, or to the body of the lift itself. Wherever you need it mounted the Kodiak comes engineered to work with a custom mounting-solution that can optimize safety while offsetting the wear-and-tear of shock and vibration. Do I need a keyboard to use the Kodiak? No, but if you want one we have virtual onscreen keyboards that work with the Kodiak’s Projective Capacitive and Resistive touchscreen options. If your application requires a lot of keyboard entry, we offer several rugged keyboards that are both backlit and waterproof. Can I use the Kodiak in areas of my facility that are very dusty or subjected to outdoor conditions such as rain? Can I connect accessories to the KODIAK such as bar code scanners and label printers? Yes. The KODIAK I/O accepts peripherals commonly found in data collection environments so customers can use any existing hardware they already have. Glacier does offer rugged label printers and bar code scanners for customers who need them.